2 Spanish Coin – For our logo, we used a Spanish silver dollar created in the early 1700’s during the European Age of Enlightenment. The coin was created in Mexico to honor King Philip V of Spain, the son of Louis, The Grand Dauphin. We chose the Philip V coin because it depicted the fable pillars of Hercules and the important statement of “Plus Ultra” – More Beyond. We converted certain elements (oh no!) and added certain innovations (aghast) found in many of our old constitutions to make it truly a masonic logo. 4 4925 A.L. A.L. (Anno Lucis, “the year of light”) refers to the Masonic practice of using 4000 B.C. as year zero, so while we would say 2018 A.D. the Masonic calendar would say 6018 (4000 + 2018 = 6018). The year 4925 A.L. (925 A.D.) reminds us of a young prince named Athelstan who ascended the throne of England. Athelstan favored masons and gave royal permission for a grand assembly of Masons in 4926 A.L. (926 A.D.). The purpose of this grand assembly was to discuss the best way to govern the craft of masonry in the realm and to improve any faults found in it. 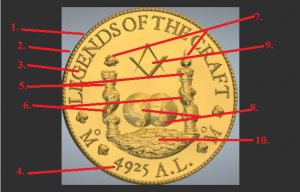 We “mythically” trace our current craft from this event. the two pillars are the central symbol, the one which gives the majority of the elements its form. It is both an invite to travel and a warning as well. 6 “Plus Ultra” Latin term for Beyond, signifying that there is more to learn and see. Previously it was written as Nec Plus Ultra, meaning nothing more beyond, signifying that there was nothing more beyond. We decided to preserve this concept of “more beyond” as a metaphor for the continual search for light. 7 Cloud and fire Exodus 13:21 – “By day the LORD went ahead of them in a pillar of cloud to guide them on their way and by night in a pillar of fire to give them light, so that they could travel by day or night.” There are some who said the two pillars in front of King Solomon’s Temple represent the pillars of cloud and fire. For our purposes, we felt the scriptures teaches a powerful lesson of faith and hope in the power of deity whether in dark or in the light. 8 Two worlds the original coin, featured two globes representing Spain’s dominance in both the old world and the new. Our coin features two spheres, one celestial and the other terrestrial. The spheres allude to man’s use of geometry to trace both the heavens and the earth and to master the two worlds, the spiritual and the material. 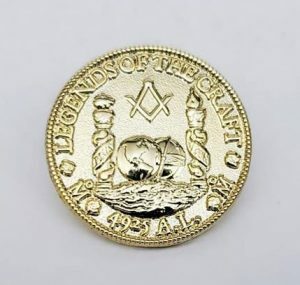 9 Square n compass while it marks this coin as Masonic, we also see it as our shining star and guide light. We also hold to the Vitruvian idea of the square representing the natural, and the circle the spiritual. 10 New world portal Portals where usually considered doorways to far off places full of wonder, fun, mystery, and danger. Entering portals on purpose was usually undertaken by one seeking adventure or arcane knowledge. It takes fortitude to enter and usually marks the start of a quest. Our portal is an idyllic vision of what awaits the man who ventures forth.